Last night, because that’s when LG likes to announce details about its upcoming flagship phone, we got to see our first look at the LG G5 in hand. 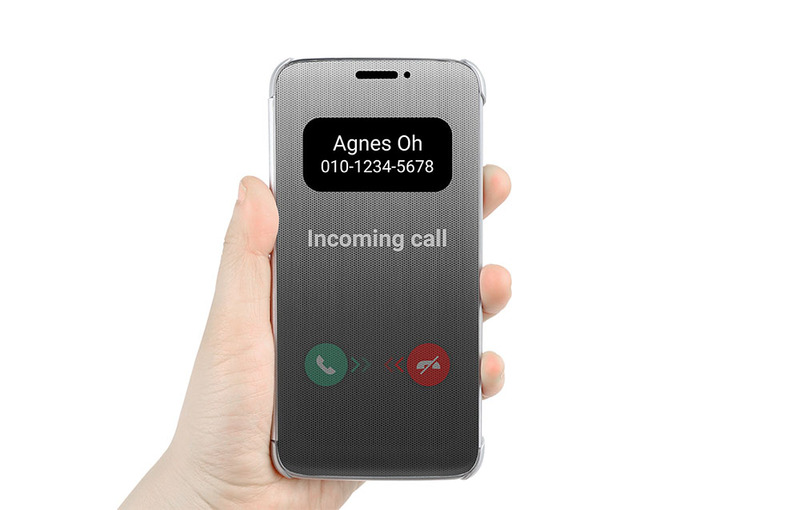 The appearance came via announcement for the G5’s new Touch-Enabled Quick Cover, a cover that has a mesh front panel that allows for interaction. The Quick Cover will be available at some point after the phone is announced, likely along with a handful of other accessories. The cover, thanks to that mesh outer, enables a user to accept or decline calls and snooze their alarms over and over again without having to pick up the phone and open it. See that picture above? Oooooh, mesh. Anyways, because Quick Covers are covers, we care more about LG’s hilarious press release and the fact that we can see a fake human hand holding the G5. We also have another shot of the phone below, though it of course, has a cover on it. In terms of size, without knowing how big that fake hand is, it’s hard to tell how big the phone truly is. With that said, it certainly doesn’t look like a tank of a phone. In the past couple of years, LG has settled into a 5.5-inch display sweet spot, with shrinking bezels, curvature to cases, and a pretty damn good in-hand feel. This phone appears to be no different. As for the hilarious press release, you can view it below, but it’s filled with “Here is a case for a smartphone that does not officially exist.” Seriously, it says that. LG speaks to the G5 as the “yet-to-be-announced” phone and phone “that does not officially exist” and “rumored LG G5.” You can’t make this stuff up. Have they not seen the handful of their own teasers and social media posts that all call this phone the LG G5 and mention that February 21 is LG G5 Day. Silly. So silly. At least we know that LG has a sense of humor. SEOUL, Feb. 11, 2016 ― LG Electronics (LG) took the wraps off a new version of its Quick Cover case, designed specifically for LG’s next generation flagship smartphone, LG G5, which does not yet exist. Known as a company ahead of the times, LG took this characterization to heart by revealing the existence of the accessory before the actual product. The latest LG Quick Cover offers the advantages of previous Quick Covers but with even more features. The touch function, recently introduced on the K10’s Quick Cover View, is now available on the G5 Quick Cover’s semitransparent mesh cover. It enables users to take calls and control alarm settings without opening the case for the ultimate in convenience. 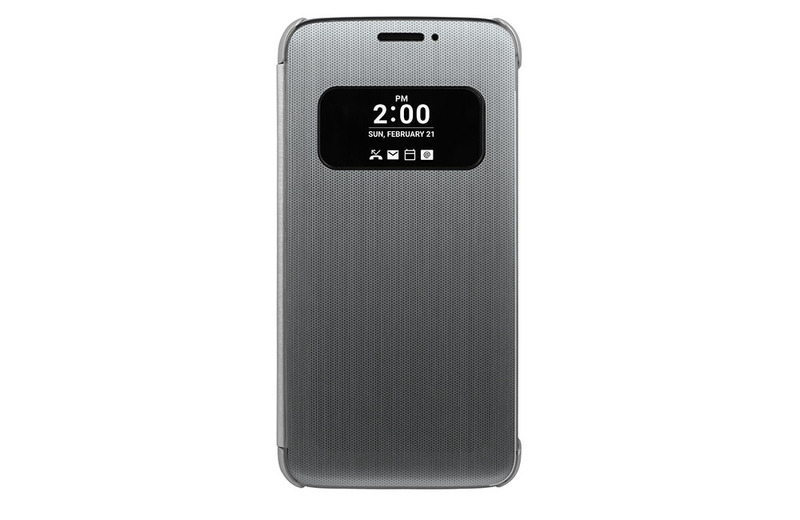 Users of the case can check the time, date and notifications on the Always-on Display of the yet unseen LG G5 even with the cover closed. LG also incorporated a unique film with a glossy metallic finish to enhance the smooth and luxurious look and feel of the cover for maximum consistency with the speculative LG G5. The Quick Cover for LG G5 will be on display at Mobile World Congress in Barcelona, Spain from February 22-25. Visitors to MWC are encouraged to stop by LG’s booth in Hall 3 of Fira Gran Via to see the LG Quick Cover and the rumored LG G5 for themselves.